In this homily, given by Fr. Michael on the Feast of Saint Juan Diego, and posted on the Feast of Our Lady of Guadalupe, we hear the story of Juan Diego, an Aztec peasant who converted to Christianity and who met twice with Mary, once while on his way to daily Mass and once again while attending to his dying uncle. What happened after those two miraculous apparitions is still having an impact on our world today. Click the arrow to watch and listen to Fr. Michael’s inspiring message. His homily concludes with a poem whose text is once again posted below. 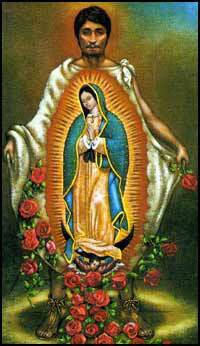 Our Lady of Guadalupe, Mother of Life, Pray for us!